So… yesterday The Legal Genealogist wanted to make a point about the kinds of records that can be used to help reconstruct a family’s history. Because I’m headed off this weekend to the spring seminar of the Sonoma County Genealogical Society, I chose — entirely at random — the collateral inheritance tax record of one Teresa Wensinger, who had property and family in San Francisco and whose estate was probated in Sonoma County in the early 1900s. Nope, I’m not descended from Teresa. I’d never heard of her before yesterday. But my friend Linda Harms Okazaki pointed out how neat it was to have this evidence of a life in the San Francisco area before the 1906 earthquake… and you know what I had to do, right? I mean… seriously… we’re genealogists. We’re the family story tellers — and story keepers. And what a story there is here. Pay attention to that last part. It’s going to come up again. WENSINGER — In Freestone, December 1, Teresa, relict of Francis Wensinger, a native of Ireland. And you know what happened next, right? I mean, we could practically have written the rest of the story without even seeing the records. Louis didn’t much like the fact that he wasn’t getting any cash himself at all. And he was particularly put out that even considering what was going to his wife and kids, their part of the estate was not nearly as much as the Catholic Church was getting. 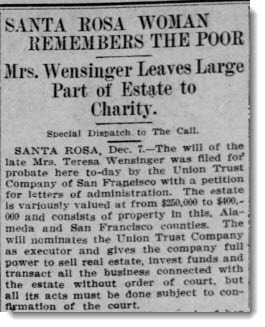 Image: “Santa Rosa Woman Remembers the Poor,” San Francisco Call, 8 Dec 1905, p. 14, col. 6; digital images, Newspapers.com (http://www.newspapers.com : accessed 12 Apr 2016). Love the interesting tidbits you share and this story was great. F.S. Wensinger was a prominent and shrewd individual, involved in early San Francisco politics within the city and the Catholic Church. However, what is found in anyone’s bank account had to come out of the bank account of another, and Wensinger left a trail of people who might have benefited from some charity while he bankrupted them. Two of those were Captain James Brennan and his partner John McHugh. They were important but largely forgotten early commission merchants who operated between central coastal California and the SF bay area. Advertisements, Daily Alta California, 17 January 1867, p.4, col. 4; digital images, California Digital Newspaper Collection (http://cdnc.ucr.edu/ : accessed 13 Apr 2016). “A UCLA neuroscientist named Keely Muscatell has published an interesting paper showing that wealth quiets the nerves in the brain associated with empathy.” From “What wealth does to your soul,” by Michael Lewis; The Week (http://theweek.com/articles/441315/what-wealth-does-soul : accessed 13 April 2016). Excerpted from an article that originally appeared in The New Republic. Reprinted with permission.